The Renaissance in Italy: Leonardo da Vinci and Raffaele—Church of St. Peter, contemporary great artists—The Italian Palazzo—Methods of gilding, inlaying and mounting Furniture-Pietra-dura and other enrichments—Ruskiris criticism. The Renaissance in France: Francois I. and the Chateau of Fontainebleau—Influence on Courtiers, Chairs of the time—Design of Cabinets—M.E. Bonnaffe on The Renaissance, Bedstead of Jeanne dAlbret—Deterioration of taste in time of Henry IV., Louis XIII. Furniture—Brittany woodwork. The Renaissance in the Netherlands: Influence of the House of Burgundy on Art—The Chimney-piece at Bruges, and other casts of specimens at South Kensington Museum. The Renaissance in Spain: The resources of Spain in the sixteenth and seventeenth centuries—Influence of Saracenic Art, high-backed leather chairs, the Carthusian Convent at Granada. The Renaissance in Germany: Albrecht Dürer—Famous Steel Chair of Augsburg— German seventeenth century carving in St. Saviour's Hospital. The Renaissance in England: Influence of Foreign Artists in the time of Henry VIII.—End of Feudalism— Hampton Court Palace—Linen pattern Panels—Woodwork in the Henry VII. Chapel at Westminster Abbey—Livery Cupboards at Hengrave—Harrison quoted—the "parler," alteration in English customs—Chairs of the sixteenth century—Coverings and Cushions of the time, extract from old Inventory—South Kensington Cabinet— Elizabethan Mirror at Goodrich Court—Shaw's "'Ancient Furniture" the Glastonbury Chair—Introduction of Frames into England—Characteristics of Native Woodwork— Famous Country Mansions, alteration in design of Woodwork and Furniture— Panelled Rooms at South Kensington—The Charterhouse—Gray's Inn Hall and Middle Temple—The Hall of the Carpenter's Company—The Great Bed of Ware— Shakespeare's Chair—Penshurst Place. It is impossible to write about the period of the Renaissance without grave misgivings as to the ability to render justice to a period which has employed the pens of many cultivated writers, and to which whole volumes, nay libraries, have been devoted. 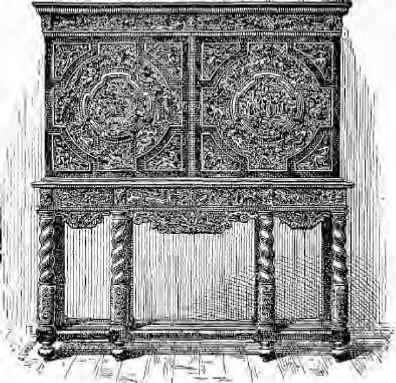 Within the limited space of a single chapter all that can be attempted is a brief glance at the influence on design by which furniture and woodwork were affected. Perhaps the simplest way of understanding the changes which occurred, first in Italy, and subsequently in other countries, is to divide the chapter on this period into a series of short notes arranged in the order in which Italian influence would seem to have affected the designers and craftsmen of several European nations. Towards the end of the fifteenth century there appears to have been an almost universal rage for classical literature, and we believe some attempt was made to introduce Latin as a universal language; it is certain that Italian Art was adopted by nation after nation, and a well known writer on architecture (Mr. Parker) has observed:—"It was not until the middle of the nineteenth century that the national styles of the different countries of Modern Europe were revived." As we look back upon the history of Art, assisted by the numerous examples in our Museums, one is struck by the want of novelty in the imagination of mankind. The glorious antique has always been our classic standard, and it seems only to have been a question of time as to when and how a return was made to the old designs of the Greek artists, then to wander from them awhile, and again to return when the world, weary of over-abundance of ornament, longed for the repose of simpler lines on the principles which governed the glorious Athenian artists of old.